It seems that with each passing month the estimates for losses in the international banking system keep rising. This time last summer the largest estimates (from credible sources), if memory serves me correct, were around $400 billion, give or take a few months. By the end of the year it was in the neighbourhood of twice that. Then last quarter we saw estimates approaching $1 trillion. Last week, the number being broached was $1.6 trillion, by Bridgewater Associates, one of the top, and more credible, analytical firms in the world. Telegraph -- Bridgewater Associates has issued an apocalyptic warning to clients that bank losses from the worldwide credit crisis may reach $1,600bn [$1.6 trillion], four times official estimates and enough to pose a grave risk to the financial system. The giant US hedge fund said that it doubted whether lenders would be able to shoulder the full losses, disguised until now by 'mark-to-model' methods of valuing structured credit. 'We are facing an avalanche of bad assets. We have big doubts as to whether financial institutions will be able to obtain enough new capital to cover their losses. The credit crisis is going to get worse,' said the group in a confidential report, leaked to the Swiss newspaper Sonntags Zeitung. Bank losses on this scale would have far-reaching effects. Lenders would have to curtail loans by roughly 10-to-one to preserve their capital ratios. This would imply a further contraction of credit by up to $12,000bn [$12 trillion] worldwide unless banks could raise fresh capital. Weather outlooks this week. The monthly long-range forecast updates come out Thursday next week, and that will provide a look at what the weather picture looks like as we head into key times in the corn and soybean growing seasons. The outlooks for August and August-October will be out Thursday morning. Crop Progress updates. After the slight uptick in corn and soybean crop ratings this week, and weather that traders viewed as crop friendly, expectations will be for even more improvement in those condition marks when the data comes out Monday morning. The figures will reflect conditions as of July 13. Hearings on markets. This week will continue the focus on efforts by lawmakers to put limits or change rules in trading of commodities. The Commodity Futures Trading Commission has been under fire for the situation, but maintain they need more staff to be able to adequately assess the situation. CRP court date. There will be a hearing July 17 in U.S. District Court on the injunction granted that halted activity on Conservation Reserve Program (CRP) haying and grazing efforts. USDA will no doubt defend the effort strongly as it seeks to restore the effort they announced in May. (Market Drayton Advertiser) -- Lloyds Animal Feeds has been fined after admitting failure to comply with an abatement order. Campaigners have secured an important victory over a poultry farm near Stoke Heath, who they blame for a plague of flies in the village, reports Market Drayton Advertiser. Lloyds Animal Feeds, which is based in Oswestry, was fined £7,000 and ordered to pay more than £10,000 costs after admitting failure to comply with a district council abatement order. Complaints began in 2005 and were investigated by environmental health officers. As a result, North Shropshire District Council served the abatement order in August 2006 on Lloyds, which has an egg production plant in Stoke Heath. Further complaints were received from local residents in April last year, and legal action was launched following another investigation. Evidence of a top in corn/soybeans? Pro Ag -- On the market side this week we have seen the first evidence of a top in corn/bean markets (the wheat ship sailed in February! ), with soybeans dropping $1.50 in 48 hours and corn dropping $.75. We have recovered from the worst losses so far this week, but it certainly opens up a whole new realm of possibilities in a marketplace that the past 22 months only included "up" in the list of possibilities. If we can drop $1.50 soybeans and .75 corn in just 2 days, can we drop $5 soybeans and $3 corn by harvest? After all, there is at least 40 days of trading in soybeans until harvest, and 60-80 days of trading for corn into harvest. We'd need to average a 10c loss in soybeans/day and only a 5c loss in corn to make these potential lows of $4.5-$5 corn and $10 soybeans this fall. While these numbers seem shockingly low compared to current $7-$7.50 corn and $15-$16 soybeans, these are still profitable levels for production of both in the US this year - even with a sharp hike in production input costs. Now there is a reason prices hit $8 corn and $16.50 soybeans - the grain S/D is remarkably bullish. Pro Ag is NOT in the camp of those who think prices will return to $2 corn and $5 soybeans - instead we think corn will trade $4-$7 and soybeans $10-$15 the next 2-5 years. This will leave agriculture VERY profitable the next 2-5 years, but the difference between profitability at $7 corn vs. $4 corn is a huge difference! Pro Ag would prefer to be on the high end of these sales levels - therefore our aggressive sales campaign lately since we got above $6 corn and $15 soybeans. These have been our multi-year (and even multi- decade) price targets since this rally began, and its time to now lock in at least some of these levels while we can. (NOTE: 2008 was there, but also 2009 and 2010 new crop the past few weeks. Add 2011 soybeans recently at the $14.50-15 level!). All this at a time when most buyers won't give you a bid beyond 6 months. There is a reason buyers are willing to pay that much 3 years out, and its because they find no willing sellers anymore. That's the perfect time to do what my wise father called "walking when everyone ran, and running when everyone walked". Pro Ag thinks its time to lock up these multi-year hedges at ungodly profitability levels - and let the cards fall where they may. If we have capital to hold these hedges (and any bank should provide it), we can't see what could derail us as we don't even need a viable (read this as non-bankrupt grain buyer) outlet for this grain as we are doing our OWN hedging now. And the beauty of that is IF corn drops $3 and soybeans $5 the next 2-4 months, we can remove these hedges and use all that capital from our hedges (note this is the opposite situation of margin calls!!!) the next few years instead of letting our buyers have it all. Which reminds me of another of my father's wise sayings: "When the cookie plate comes around in business, don't be afraid to take two!" Roy Smith: "this weather is just what we need for perfect crop development"
The weather today at my farm is typical for a July day in eastern Nebraska. The temperature is around 90 degrees and rising. The humidity takes your breath away. The forecast is for the top to be around 94 degrees this afternoon. I promised to mow the yard this afternoon. Right now spending time at the computer in my air-conditioned office seems like a better idea. I know that some areas are already getting dry after some torrential June rains. I know that other places are still hoping to dry out. At my place, this weather is just what we need for perfect crop development. We had an inch and a quarter of rain on Monday and Tuesday. I would like to say it was nice gentle precipitation, but unfortunately the rain Tuesday came as hard as I have ever seen. I am glad it did not last very long. The change in appearance of the crops amazes me. In a week's time corn which was yellow from too much water has turned a dark green as the roots reached deep nitrogen. Soybeans that were planted earliest and in 15 inch rows now shade the space between rows. Traders in Chicago who drove into the countryside over the July 4 weekend obviously saw the improvement in conditions when they returned to the trading floor on Monday. As I mentioned last week, it is common to see a change in trend following the Independence Day holiday. That certainly happened this year in the corn market. It makes the sale of cash corn I did on June 27 look very good. What a relief to have the bins empty and not be faced with cleaning them out during this heat and humidity. Looking at the government reports from last week and this week, it seems as if price action is not following logical path. One of the sayings on my Murphy's Laws poster says. "The market is not logical, it is psychological." I should quit trying to calculate the fundamental factors and just go with the trend. Long term seasonal charts show a down trend in the corn market from late June through the end of September. I doubt that prices this year can go down that long without at least one rebound. However, with prices where they are and the appearance of the crop continuing to improve, odds are good prices will be lower at harvest than now. Soybeans this week have taken a different direction. Carry over is certainly low enough to justify price strength. However, with futures over $15, some weakness before harvest is easy to rationalize. Long term charts show prices trending down now, but recovering in August and early September. We need to keep in mind the possibility of Asian Rust developing with this humid weather. If that happens, all bets are off. Meanwhile enjoy the contra seasonal price strength and hope that if the rust comes it will be too late to damage yields. Corn stopped the rot closing around 4-6c higher despite a bearish slant to the USDA numbers. For corn, the USDA estimated the U.S. 2007-08 carryout at 1.598 billion bushels, vs. its June estimate of 1.433 billion bushels, and the average trade estimate of 1.514 billion. For 2008-09, the USDA's corn carryout is pegged at 833 million bushels, vs. its June estimate of 673 million bushels, and the average trade estimate of 820 million bushels. Almost as soon as it had been issued, the report was being dismissed as minor in comparison to the Aug 12 report which will more accurately reflect the impact of the recent Midwest flooding. On the week as a whole cash US corn prices dropped a pretty steep 65 cents. The last of nearly a dozen flooded navigational locks on the middle Mississippi River reopened to commercial traffic July 6, permitting a resumption of grain barge traffic to New Orleans-area export terminals. Beans actually behaved pretty predictably for once. Nearby July closed 21c higher, with gains gradually diminishing as we go further forward into new-crop months which posted gains of 6-9c. The USDA report came in pretty much bang on the button of expectations forecasting 2008-09 U.S. soybean ending stocks at 140 million bushels, compared to 175 million in June and the average analyst estimate of 139 million. The USDA pegged 2007-08 soybean stocks at 125 million, unchanged from June. The average of analysts' pre-report estimates was 123 million. A choppy session saw new-crop Nov fluctuate between 24c down and 33c up, before deciding to meet in the middle and settle 9c firmer. The nears supported by the tight balance sheet and the prospect of a pick up of exports if & when the Argy farmers eject their toys from the perambulator (again). The Midwest weather looks non-threatening at the moment, but there will undoubtedly be weather scares ahead in August (too hot/dry) and beyond (too cold/early frost). I'll still take prices to work lower once the crop is in come October. On the week as a whole a 33 1/2-cent drop in CBOT August futures also took the value of soybeans in U.S. storage off recent record highs. Wheat finished around 12c higher on what is being called "short-covering and technical buying" despite a neutral/bearish USDA report. The USDA estimated 2008-09 U.S. wheat carryout at 537 million bushels, compared to the average analyst estimate of 538 million and the agency's June estimate of 306 million. The government's projection for all winter wheat production of 1.864 billion bushels was above the average analyst estimate of 1.852 billion. The US is still in the middle of harvesting winter wheat and things are looking pretty good. The chances are that the 1.864 billion production number will get bigger as time goes on. "Combines are in northern Kansas, finding much better-quality (HRW) wheat,along with yields that continue to impress. Even northwest Kansas, which was still in the drought region, has seen areas of 40-60-bushel yields, proteins understandably high in the 12-16% range, and (test) weights also impressive, of up to 64 pounds (per bushel)," said Spectrum Commodities analyst Louise Gartner. The USDA also upped its Australian 2008 crop estimate 1mmt, and pegged the world crop higher than last months as well. All this, yet the market closes higher, a further indication that the futures markets are becoming further divorced from the reality of the cash markets? It would seem so as CIF HRW wheat basis reportedly fell 4-10c last week and HRS basis fell 25 cents. Still on the week as a whole seasonal harvest pressure and weak export demand eroded cash winter/spring wheat prices this week, slashing spot HRW/HRS/SRW futures by about 38-57 cents. Certainly the US aren't going to find themselves awash with export interest now that the combines are rolling in the Black Sea regions. Sure, they will pick up their usual orders from South Korea, Japan and the like but any interest from the likes of Egypt and Pakistan will be eagerly mopped up by Russia and the Ukraine. The USDA today upped it's world wheat production estimate 1.3mmt to 664mmt, 8.8% up on 2007. Today's USDA report is being called bearish corn & wheat and neutral soybeans. Although all wheat production was seen lower than anticipated at 2.461 billion bushels, all winter wheat production was higher than expected at 1.864 billion. The reason for the overall reduction lies with spring wheat which was pegged at 506m bushels vs expectations of 546m. As winter wheat is being harvested now and spring wheat has only just been planted there is time yet for the spring crop to improve. Soybean carryout came in pretty much bang on with expectations. Corn carryover was higher than expected for both 2007/08 and 2008/09. The report might be bearish/neutrel, however strong crude oil again today looks like underpinning the market. Crude is nudging $145 at the moment, at $144.76/barrel. It's only been out half an hour and already it's history! Tomorrow's headlines (again): Outside markets support. The early calls are beans up 10-15c, corn up 5-7c and wheat mixed. The USDA today pegged 2008/09 soybean carryover at 140m bushels, fractionally higher than the 0.139m anticipated. Corn carryout was 833m bushels, higher than the 820m expected by the trade. Wheat carryout was seen at 537m bushels, in line with expectations of 538m. Today's USDA report pegged 2007/08 soybean carryover unchanged from last month's 125m bushels, a little higher than the anticipated 123m bushels. Corn carryout was pegged at 1.598 billion bushels, higher than the 1.514 billion the trade expected. Wheat carryout was 306 million bushels exactly in line with expectations. In today's eagerly awaited crop production report the USDA pegged all wheat output at 2.461 billion bushels, slightly lower than the avg trade estimate of 2.478 billion, but well up on 2007's 2.067 billion bushels. All winter wheat production was 1.864 billion, against the avg trade estimate of 1.852 billion, but spring wheat production was 0.5066 billion against the avg trade estimate of 0.546 billion. Corn closed around 7c firmer overnight, with wheat up around 3c and beans 10-14c higher. This afternoon's direction will come from the outcome of the USDA S&D numbers released at 13.30BST. FWi -- Construction work has started at the site of a new GBP200m bioethanol plant in Saltend, near Hull. The plant, which will take 1.1m tonnes of mainly UK-grown wheat, is a joint venture between Associated British Foods (45%), BP (45%) and DuPont (10%), called Vivergo Fuels. All regulatory approval and funding is in place and preparatory groundwork at the 25-acre brownfield site is almost complete, Vivergo managing director, David Richards says. "We're now moving on to the next stage of construction and are on target to start producing ethanol in summer 2010. It's fully equity funded, so all funding is in place." Frontier will be the exclusive grain supplier, taking grain from over 1000 growers, and trading director Jon Duffy says the firm is already talking to farmers to develop growing regimes that ensure wheat supplying the plant is grown in a sustainable manner. Ultimately, you need to grow for maximum yield to reduce the carbon footprint, but we are also looking at all other aspects of production. This grower protocol is likely to be included within contracts, details of which have not been drawn up, he says. The bulk of grain will be for harvest 2010, or drilling in autumn 2009, so we're still a year or so away from offering contracts. We haven't confirmed what varieties will be used, but high-yielding, starchy feed-type wheats will obviously be preferable. Mr Duffy stresses that wheat supplying the plant will not detract from supplies going into existing food customers. Most will come from Yorkshire and Lincolnshire and is grain that would have otherwise been exported from Hull and Grimsby, he says. Even with this plant and another [ethanol plant] on Teeside, there will be an exportable surplus of wheat in the UK it's more a case that the patterns of grain movement are changing. We want to source wheat from UK growers, and for 90% of the time, that will be the case. The only time we may have to buy in grain is when the UK has a poor harvest. Mr Richards welcomed some findings of the recent Gallagher Review, particularly the focus on sustainability and reducing greenhouse gas emissions, but said the slow down of targets was counterproductive. Due to lack of political will and clarity in government policies, ethanol-blending has not only failed to pick up in India but also lost out on foreign participation in the sector. A couple of Japanese companies that had earlier shown interest in setting up fuel-grade ethanol manufacturing plants in India have shelved their plans as they don't see potential in the country. Pramod Chaudhari, the chairman of biofuels technology major Praj Industries Ltd, said, "Earlier, a few Japanese companies such as Mitsui and Mitsubishi had approached us to source technology and equipment for setting up fuel-grade ethanol plants in India. They have shortage of land in their country so they wanted to put up plants here and export ethanol to Japan." They might have cancelled their plans, Chaudhari said. He said that in 2003, the government had put forth a policy to incentivise fuel-grade ethanol manufacturing by offering subsidies to oil marketing companies on every litre of ethanol-blended petrol sold in the market. However, the policy was scrapped in 2004 and no further steps were taken to promote the sector. Since then, the sector is floundering. "There are some states that promote ethanol-blending but many are still dragging their feet on the issue," Chaudhari said. Nope it's not April 1st. Amazing, but true, in Argentina they are strapping plastic tanks to cows backs to study the amount of greenhouse gases the cows produce. With this knowledge, better solutions can be designed in a bid to stop global warming, they say. The Argentine researchers discovered methane from cows accounts for more than 30 per cent of the country's total greenhouse emissions. As one of the world's biggest beef producers, Argentina has more than 55 million cows grazing in its famed Pampas grasslands. Guillermo Berra, a researcher at the National Institute of Agricultural Technology , said every cow produces between 8,000 to 1,000 litres of emissions every day. Methane, which is also released from landfills, coal mines and leaking gas pipes, is 23 times more effective at trapping heat in the atmosphere than carbon dioxide. Scientists are now carrying out trials of new diets designed to improve cow's digestion and hopefully reduce global warming. Silvia Valtorta, of the National Council of Scientific and Technical Investigations, said that by feeding cows clover and alfalfa instead of grain "you can reduce methane emissions by 25 percent". Drought-tolerant wheat developed in Victoria, Australia is returning yields up to 20 per cent higher than non-GM control crops, the Premier of Victoria, John Brumby, announced at the BIO International Convention. Mr. Brumby said large wheat-producing countries affected by drought, such as Australia, the USA, Argentina, China and India, were having to embrace new technologies to continue to meet the demands of the global wheat market. "These initial results are very promising and suggest that these genetically modified wheat lines may be part of the solution to help farmers maintain and improve their crop yields in a changing global environment," Mr. Brumby said. "Drought significantly reduced Victoria's wheat crops in 2006-07. With average yields worth approximately $300 million, a 20 percent boost could provide as much as $80 million to our wheat industry. "Around the world, 35-50 per cent of wheat-growing areas are under drought risk. The number of drought-affected wheat growing areas is likely to increase with the effects of climate change." Mr. Brumby said Victoria's $230 million Biosciences Research Centre - a joint venture between the Victorian Government and La Trobe University in Bundoora - would boost Victoria's capacity to make important discoveries. Department of Primary Industries (DPI) Research Division Executive Director Professor German Spangenberg, who has been leading trials near Horsham and Mildura, said analysis of the crop, grown last year and harvested early this year, confirmed increased crop yields and maintenance of grain size. "Twenty-four lines of GM wheat were tested and, of those, seven were identified as providing higher yields under drought stress," Professor Spangenberg said. "Two lines exceeded the yield of the control experimental variety by 20 per cent." (The Public Ledger) -- CARGILL and Bunge were raided by the European Commission (EC) on Thursday in a sweep of traders and distributors of cereals and other agricultural products for human consumption and animal feed in two EU countries. "The commission has reason to believe that the companies concerned may have violated (EU) ... rules on cartels and restrictive business practices," it said. The raids were conducted in co-operation with national competition agencies. Although the EC did not identify the countries, traders or companies involved, it later emerged Cargill and Bunge's offices in Italy were raised. Both US-based firms said they were co-operating with EU officials. Archer Daniels Midland said its offices were not involved in the raids. The EC, the European Union's executive arm, said its raids were part of an investigation and no judgement had been made on whether the companies were guilty of fixing prices. "Surprise inspections are a preliminary step in investigations into suspected cartels," the statement said. "The fact that the EC carries out such inspections does not mean that the companies are guilty of anti-competitive behaviour; nor does it prejudge the outcome of the investigation itself." The raids come at a time when grain prices have soared to record highs amid strong demand, production problems and the use of grain to produce biofuels that have lifted food prices. Companies judged to have participated in a cartel can face substantial fines by the EU executive of up to 10% of annual turnover. For large corporations, fines have never come close to that cap. There is no time limit for the EC to investigate. Corn is up overnight on speculation that recent losses have been overdone, and supported by a late surge in crude last night. There is also an element of position squaring ahead of this afternoons USDA report. Corn is around 7-8c firmer this morning. Beans are 6-7c firmer this morning ahead of the USDA report. Many traders reckoning that the USDA report is more likely to be bullish on beans that anything else. The spectre of more disruption by Argy farmers will help support what is an already tight old-crop supply situation. Wheat is around 8c firmer, correcting recent losses. Recent favourable weather and mid-harvest evidence points to the possibility of the USDA raising it's US wheat output figures this afternoon. Crude wants keeping an eye on as well after jumping $5/barrel in late trade last night. On the bullish side there we have the threat of a Brazilian oil workers strike plus the usual Middle East tensions centring on Iran and the old chestnut of Nigerian unrest. Early trade on CBOT sees Dec corn 9 1/2c lower, Sept wheat 7c lower and Nov beans up 6 3/4c. (Freese Notis) -- For a lot of places in the Midwest, the weather over the next two to three days will be about as hot as it has been so far this summer, but it still looks like that heat is not going to last for very long. Especially areas west of Interstate 35 will reach the 90 degree mark for today's high temperature, but highs above the 90 degree mark should be pretty common for tomorrow just about anywhere in the Corn Belt. That heat is pressed southward into just the southern third of the region for Saturday, and the cooler weather seen that day in the northern Corn Belt looks to dominate the entire region then for Sunday through about Tuesday (or even Wednesday as it pertains to eastern parts of the region). Especially the northeastern half of the Midwest could see two to even three days during that time frame in which high temperatures do not climb above the 80 degree mark. We will see warming temperatures for later next week, with some signs that notable heat could be impacting especially western parts of the region for July 20 and beyond. Rain that fell in the Midwest the past 24 hours was extremely spotty in nature (most places got nothing), and a few isolated thundershowers were still shown in parts of the region early on this Thursday (with a more concentrated area of rain found in northeastern Nebraska). Almost any location in the Corn Belt could see a widely scattered storm over the next 24 hours as warmer air works into the region, then a strong cold front diving southeastward will be the next threat of rain, first for northwestern part of the region (tomorrow and tomorrow night) and then in the southeastern areas (Saturday and Saturday night). There could be a fair amount of severe weather activity with the cold frontal passage, but widespread rains of more than a half inch probably will be most common only in areas near the Great Lakes. The set-up for rainfall for the middle and latter parts of the next week is looking pretty decent for northern and northwestern parts of the region, which is an area that could use some rain right now (northern Nebraska, eastern South Dakota and all but extreme southeastern Minnesota have recorded below-normal rainfall over the past 30 days, with some places recording less than half of their normal totals during that period). Wheat net sales of 617,100 metric tons. Corn net sales of 337,400 MT for the 2007/08 marketing year. Net sales of 306,900 MT for delivery in 2008/09 . Soybean net sales of 66,400 MT for the 2007/08 marketing year. Net sales of 222,500 MT for 2008/09 delivery. Soymeal net sales of 62,600 MT for the 2007/08 marketing year. Net sales of 300,000 MT for 2008/09 delivery. Soyoil net sales of 15,600 MT for the 2007/08 marketing year. Net sales of 28,500 MT for delivery in 2008/09 . LONDON (AP) — The Bank of England has kept its benchmark interest rate unchanged at 5 percent. The decision Thursday confirms expectations by economists that policymakers are now more concerned about surging inflation than the slowing domestic economy. It is the third consecutive month the bank has held rates steady. It had made two quarter-point cuts earlier in the year amid signs that the economy is heading for a significant downturn as the housing market stalls and consumer confidence falls. "We still think the next move will be down," said Vicky Redwood, an economist at Capital Economics. "It might not be for a few months yet, although if the activity data continues to weaken sharply as it has done in recent weeks then we might not have to wait too long." However, further cuts could spur inflation, which is already well above the bank's 2 percent target rate, and some economists now expect the next move from the bank to be a rise in interest rates. However, the minutes to this week's decision -- due on July 23 -- could show a split among policymakers. Arch dove David Blanchflower is unlikely to have dropped his call for lower interest rates but there is also plenty on the inflation front for hawks such as Andrew Sentance and Timothy Besley to argue that rates need to stay on hold for some time. Allendale have released their pre-report estimates this week, ahead of the USDA's Wheat S&D report due tomorrow at 13.30BST. Allendale is expecting all wheat production at 2.426 b bu, down slightly from 2.432 b bu in USDA's latest estimates and below the 2.513 b bu of Informa. Allendale sees winter wheat at 1.815 b bu, near the USDA's guess and below Informa. Other spring wheat is 525 m bu in Allendale's estimate, vs 545 m bu in Informa's. The USDA won't be providing any crop production updates on corn and beans tomorrow. Those numbers will wait until August. Allendale, however, have issued revised S&D figures for beans and corn. Soybean production with them is expected at 2.957 billion bushels, below USDA's previous estimate of 3.105 b bu, and also below that of Informa of 3.019 b bu. Allendale said it is assuming yields at 41.0 bu per acre, slightly below the 41.2 bpa Informa is using and USDA's 41.1. If realized, Allendale said ending stocks for soybeans for 2008/09 would fall to a scant 100 million bushels, the tightest ending soybean stocks since 1972. For corn, Allendale is projecting the crop at 11.896 b bu, above USDA's 11.735 b bu but below the 12.002 projected by Informa. Allendale is using corn yield at 150.7 bpa vs Informa's 152 and USDA's 148.9. Corn stocks in 2008/09 would be 480 million bushels, vs 487 m bu projected by USDA in the June WASDE reports. Corn futures are called 5 to 6 lower, soybeans 4 to 8 lower and wheat 2 to 4 lower. On the overnights Sep corn closed 5 1/4c lower, Sep beans 7 3/4c lower and Sep wheat 3 3/4c lower. The trade remains cautious ahead of tomorrow's USDA S&D report. Early call is subject to revision pending the release of the weekly export numbers at 13.30BST. This is not a spoof it's true. I thought I'd check out the weather down under seeing as the previous report was talking about a significant rain event. The website I went to http://weather.news.com.au/ mentioned snow! "A high will cause strong winds and showers to ease across southern NSW, VIC and TAS and cause snow falls to clear. The high will clear SA and keep the rest of the interior dry. A deepening low will cause showers and storms to spread across western and southern WA. " I thought I was seeing things so I searched for it on YouTube and found that it has indeed been snowing in Australia this week. (AP) -- Wheat farmers may enjoy a "significant harvest" this year if crops get much needed winter rains, federal Agriculture Minister Tony Burke says. Meteorologists are predicting some of the best rainfalls for the year this week over much of the country. Mr Burke told reporters that winter rains would be crucial to the size of the harvest. "The optimism of the wheat crop will depend very much on what happens over the comings weeks and months," he said. "There is a higher level of optimism that there was 12 months ago." But Mr Burke said 12 months ago, much of what had been expected for that crop "fell over". "We had a good moisture profile at the time of planting, there is an opportunity that we may well see quite a significant harvest this year. "But we're still in the hands of whether we get those much-needed, much-wanted and much-prayed-for winter rains." 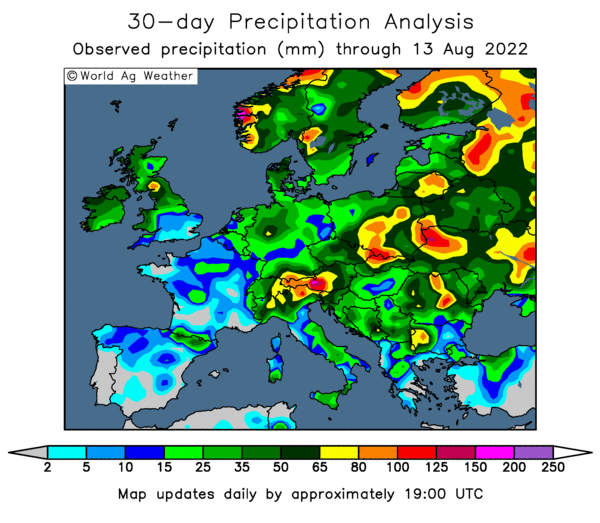 The U.S. ag attache in the European Union says improved prospects for the EU harvest mean total grain production there is currently expected to reach 294 MMT this summer. Within this total, wheat production is put at 142 MMT, barley at 62 MMT and corn at 57.4 MMT, all increased tonnages as compared to expectations two months ago. 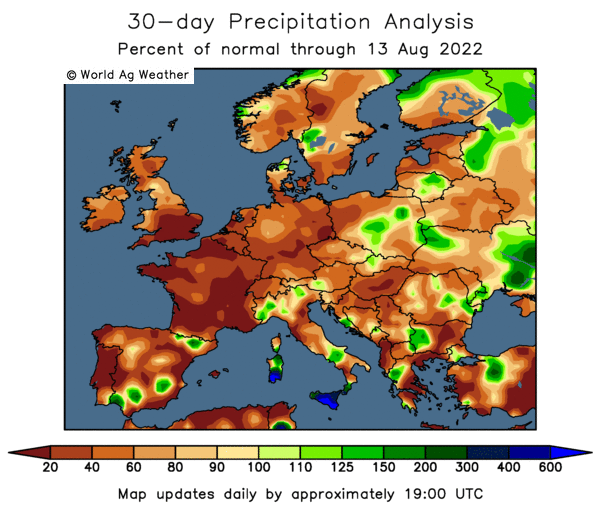 "May and June have seen dry conditions in north Europe being more than offset by favorable growing conditions in both the south east and west. However, as was demonstrated last year, these changes remain subject to further revision pending weather conditions over the critical coming weeks," says the attache. Total grain production of 294MMT is 39MMT up on 2007's 255MMT. Wheat at 142MMT is 23MMT up on last seaon's 119MMT, barley shows an increase of 4MMT on 2007, and corn 10MMT more than a year ago. The latest USDA Weekly Export Sales Report for w/e 3rd July is released at 13.30BSt today. (Irish Farmers Journal) -- Broken weather continues to delay the start of the 2008 winter barley harvest with the earliest crops now ripe. 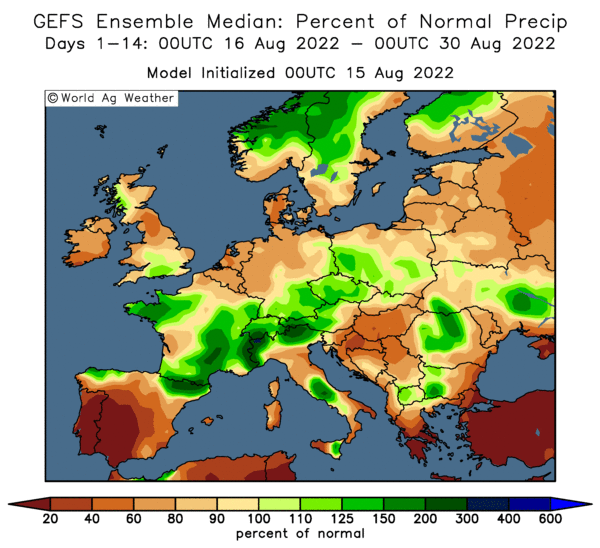 It may still be some time before combines get out into fields, with Sunday being the only day to have no rain predicted, according to Met Eireann's forecast in this week's Farmers Journal. With the European harvest now underway, French barley yields are reported to be good. Russia also looks set to have a very large harvest (85 to 91 million tonnes of grain predicted), so it would seem that there may be a lot of grain chasing a limited small-grains market this harvest. It seems likely that we will still have some barley carried over from last harvest, but this is now much less than was originally suggested. Trade sources suggest that this may now be in the order of 60,000 tonnes to 65,000 tonnes, nearly half what was predicted a few months ago. The delay in harvesting, if it continues, could further eat into these stocks. Meanwhile, prices tend to be all over the place. Spot prices for barley have improved somewhat at home but lack of demand remains a factor. Futures markets are fluctuating considerably and even maize prices in Chicago have begun to weaken. Some people in the trade now suggest that €160/t to €165/t for green wheat, with barley €10/t lower. There's not a lot to get excited about this morning in the overnight markets. Corn stand around 3-5c lower, beans around 5-6c easier and wheat mixed, mostly around 2c firmer. Favourable Midwest weather is weighing on corn this morning, whilst beans seem to be lower in a reaction to last night's strong gains, as traders take some profits and square the books ahead of tomorrows USDA report. Wheat is a tad firmer, although improved weather will speed the US harvest, in again what seems to be an book squaring reaction to last night's weaker close. South Korea bought 330,000MT Black Sea wheat last night as it's a cheaper alternative to US corn. French arable crop office ONIGC said on Wednesday it expected soft wheat production in the European Union to jump to around 130 million tonnes in the 2008/09 season, up 12-15 percent from 2007/2008. Last year's harvest had been below average due mainly to bad weather at the end of the cycle. "We should have a fair crop with a satisfactory quality level," ONIGC deputy director Patrice Germain told reporters. This higher output could lead the 27-member bloc to have an exportable surplus of around 11 million tonnes, against a weak 8.8 million tonnes exported in 2007/2008 when European wheat was not competitive enough against other origins, it said. High maize prices linked to uncertainties concerning the U.S. 2008 corn crop should boost demand for wheat in animal feed in the EU, ONIGC also said. "Soft wheat's place (in feed) could jump 20 percent to 58 million tonnes against 49 million in 2007/2008", Germain said. In its first crop estimates for the season that started at the beginning of the month, ONIGC put the bloc's barley output (winter and spring) at more than 61 million tonnes, up 7 to 8 percent from last year. Here again, the EU's exportable surplus would rise from last season, pegged at 4.2 million tonnes, against 3.7 million exported in 2007/2008. This rise could be partly filled by a rise in interest from international buyers attracted by good quality levels that would make it fit for brewery uses, Germain said. Weather permitting, the EU maize output was expected at more than 56 million tonnes, up 15 percent from 2007/08, ONIGC said. Maize use in animal feed was seen dropping five million tonnes below last year at 45 million tonnes in favour of wheat. However, imports from outside the bloc were expected to come back to normal levels after the record 15 million tonnes last season when the European Union suspended tariffs on nearly all grains, opening the door to massive shipments of cheaper maize, notably from Brazil. Carr's Milling Industries Plc. said it has continued to enjoy strong trading, particularly in agriculture. The Board says it now expects profit before tax for the year to 30 August 2008 to be in excess of £9.2m (2007: £5.5m) on revenue of at least £330m (2007: £253m). These would represent increases of 67% and 30%, respectively. The statement says Carr's has made further gains in market share in animal feed. Since 1 March 2008, compound and blended feed has increased its volumes and increased its revenues substantially (following increases in the cost of the principal raw materials, feed wheat and proteins). Volumes of low moisture feed blocks, in each of the UK, the USA and Germany, are also up on last year. After an unusually busy first half (reflecting forward buying by farmers), fertiliser sales were also strong in the traditionally busy months of March and April. Continuing fertiliser raw material price inflation is resulting in increased sales, as many farmers are buying this year for next year's usage. Associated British Foods plc today issues its third quarter management statement, in accordance with the requirements of the UK Listing Authority's Disclosure and Transparency rules, for the 40 weeks ended 21 June 2008. Sugar 5%, Argiculture 30%, Grocery 22%, Ingredients 18%, Retail 20%, Total Group 19%. Say's it's agriculture businesses continued the strong performance delivered in the first half. Frontier’s strong position in grain trading and increased demand for farm inputs drove further sales growth and UK animal feeds performed well. Announces the merger of Ryvita with Jordans the UK breakfast cereal and cereal bar business. ABF will have a 62% interest in the new business. The merger, which is expected to complete before the year end, will create a leading position for the supply of products to meet the increasing consumer demand for natural ingredients and healthy eating. Some cost savings will be achieved and both brands will be developed. The increased scale will enable a greater impact in all sales channels, particularly in convenience and impulse, and faster overseas expansion of the Jordans brand using the group’s international grocery presence. (Herald Tribune) -- Credit jitters swept Wall Street again on Wednesday and pushed a key market index back into bear territory as financial shares fell and the appeal of government debt took a shine. Oil pulled out of a steep two-day slide to end little changed after a U.S. government report showed a big drawdown in nationwide crude inventories and after Iran, a member of OPEC, conducted missile tests in a move that raised tensions with the West. Iran's testing of long- and medium-range missiles, including one that could reach Israel and U.S. bases in the Middle East, led the dollar to retreat and bolstered haven currencies such as the Swiss franc. The Dow Jones industrial average closed down 237.26 points, or 2.08 percent, at 11,146.95. The Standard & Poor's 500 index fell 29.03 points, or 2.28 percent, at 1,244.67. The Nasdaq composite index dropped 59.55 points, or 2.60 percent, at 2,234.89. The broad market S&P 500 index fell into a bear market at day's end, territory defined as a 20 percent decline from a recent peak. Banking shares tumbled and some investors worried that Fannie Mae and Freddie Mac might need a substantial capital injection, sending shares of the two major U.S. mortgage finance sources sharply lower. The KBW banking index fell 5.7 percent, while Freddie Mac shares dropped almost 24 percent and Fannie Mae's fell about 13 percent. "The financials are not recovering. Some of the regional banks are showing signs of weakness and starting to crack a little bit," said Seth Plunkett, a portfolio manager for fixed income with American Century Investments in Mountain View, California. "Over all, we are seeing somewhat of a flight to quality and strength in Treasuries," he said. "There's still a lot of uncertainty out there, so it's going to be hard for the market to make any real progress," said Alan Lancz, president of Alan B. Lancz & Associates, an investment advisory firm in Toledo, Ohio. "Real estate prices are going down, and the earnings power that financial stocks had is going to be gone forever." Just after the opening bell Wednesday soybeans stood around 10c firmer, with meal $1.50 up and oil up 65 points. Corn was 8c lower, with wheat following suit 7 1/2c easier. FO Licht has increased it's world 2008 wheat output forecast by 2.6mmt from last month's estimated 652.0mmt to 654.6mmt. (DTNAg) -- What a difference a week can make -- in futures prices, and in crop prospects. Dec corn closed overnight at $7.13, 40 cents below a week ago. But in that week, corn yield prospects have improved considerably, according to a weekly outlook from a private forecaster, AIR Worldwide. In its weekly CropAlert email, the company put its current U.S. yield forecast at 143.8 bushels per acre, up from 142.1 a week ago. AIR also issues an "enhanced yield forecast" based on "extending the current growing conditions by using weather projections from AIR's seasonal forecast model system," and this is the interesting number: the enhanced yield forecast now pegs U.S. corn at 153.6, up from 149.9 a week ago, and USDA's June estimate of 148.9. Why such a jump? "Conditions in the flooded regions of the Mid-West have begun to improve, and the forecast is favorable for that improvement to continue," the company said in an email. Last week's outlook still reflected the uncertainty of the floods in the Midwest, according to Tim Doggett, senior research meteorologist at AIR. Doggett told me that he thinks maybe the flooding was early enough that crops could see a rebound. He said it's important to note that the yield forecast is based on harvested acreage, something the weekly CropAlert does not forecast. But if you use USDA's latest harvested acreage projection of 78.94 million acres, the increase in yield would take the crop up about 209 million bushels, to 12.04 billion bushels. HEAVY rain was predicted to drench South Wales, with up to three-quarters of a month’s average rainfall expected today. South Wales was expected to bear the brunt of the UK’s wet weather with more downpours expected until Friday and lighter showers on Saturday. Forecaster Matt Dobson, from MeteoGroup UK, said a band of rain had been falling since midnight and a second band was expected later today. The wet weather was expected to continue into the evening, although most areas should be drier by midnight. He said: “I think much of south Wales will see at least 30mm of rain through the day, probably up to about 50mm across hills and land. “That’s getting on for three-quarters of the average month’s rainfall. Hopes that there might be some new crop barley cut in parts of Pembrokeshire this week may have been somewhat premature! Local media report that staff at the Fenland Foods plant in Grantham, East Midlands, have agreed to a redundancy package from parent company Northern Foods. Northern Foods had made public its plan to mothball the site following the end of a supply contract with Marks & Spencer, as reported on FLEXNEWS mid-May. The plant, which used to produce M&S’s Italian ready meal range, will close on 25 August, add the reports. (Herald Tribune) -- The analyst at the credit ratings agency was blunt: "Let's hope we are all wealthy and retired by the time this house of cards falters." That candid assessment, e-mailed to a colleague in December 2006, referred to the market for certain investments linked to subprime mortgages - investments that were assigned top, AAA ratings from major agencies, only to later plummet in value. That e-mail message and dozens like it were disclosed Tuesday in a blistering 37-page report issued by the Securities and Exchange Commission, which confirmed what many on Wall Street had long suspected: The major ratings firms, including Fitch, Moody's and Standard & Poor's, flouted conflict of interest guidelines and considered their own profits when rating securities, among other suspect practices. The report represented a definitive dent in the aura of objectivity that has been cultivated for decades by ratings firms, considered the ivory towers of Wall Street. Investors, public and private alike, often gamble billions of dollars on securities the agencies deem reliable. The assumption was that the firms' analysts - ostensibly disinterested types who assess the financial health of everything from states and cities to complex mortgages - offered a bias-free view of potential investments. Instead, the SEC found that the agencies became overwhelmed by an increase in the volume and sophistication of the securities they were asked to review. Analysts, faced with less time to perform the due diligence expected of them, began to cut corners. "It could be structured by cows and we would rate it," an analyst wrote in April 2007, noting that she had only been able to measure "half" of a deal's risk before providing a rating. The agencies continued to issue ratings despite frequent complaints from managers that they had neither the time nor manpower to sufficiently measure the safety of investments. "We do not have the resources to support what we are doing now," a managing analyst wrote in an e-mail message in February 2007. The trust in the ratings firms plays a vital role in the modern financial system. To ensure their bonds are rated AAA, many states and cities buy specialized insurance policies that are themselves dependent on premium ratings. The agencies appear to be taking steps to address the problems; Moody's has ousted two high-ranking executives in the last two months. The report was the result of a 10-month investigation into practices at Fitch, Moody's and S&P. None of the e-mail messages or findings were attributed to an individual firm, according to standard commission practice, a spokesman said. The report also turned up evidence that ratings firms ran afoul of basic guidelines intended to avoid conflicts of interest. It is common practice for investment banks and other financial outfits to pay agencies to rate assets they will later sell. Agency regulations often require analysts - the people actually rating the securities - to remain unaware of any business interests involved with the products whose safety they are gauging. The SEC found that this was not always the case. "There does not appear to be any internal effort to shield analysts from e-mails and other communications that discuss fees and revenue from individual issuers," the report said. Corn is lower again on the overnight eCBOT market continuing liquidation from it's recent high, currently standing around 5-7c lower. Beans are up around 15c on a technical rebound from recent losses, supported by firmer crude oil and a weaker dollar. Wheat is 4-5c firmer "just because." (Mailonline) -- Britain's Big Six banks staged a dramatic rescue of Bradford & Bingley last night in a bid to avert a new Northern Rock crisis. Under pressure from the financial services regulator, they agreed to buy a large chunk of shares in the beleaguered bank. The bail-out followed a £400million rights issue by the former building society which was sunk when its shares plunged further during a day of bloodletting on the stock market. Up to £36billion was wiped off the value of Britain's biggest listed companies amid fears of recession. Bradford & Bingley shares, which have fallen by nearly 90 per cent over the past year, have now dropped to a level where shareholders will refuse to buy any more. They were described as worthless by one analyst yesterday and the rights issue was described as 'a dog's breakfast'. Existing shareholders had been offered the chance to buy at a 'discounted' 55p. But the price nosedived a further 19 per cent to a record low of 34p yesterday, following a fall of 16 per cent on Monday. It is understood the six banks, HBOS, Abbey, Barclays, Lloyds TSB, Royal Bank of Scotland and HSBC, stepped in after being leaned on by the Financial Services Authority. They have promised to buy the shares which Bradford & Bingley's main underwriters, the American investment banks UBS and Citigroup, do not buy, a procedure known as ' subunderwriting'. As a result, the high street banks will end up owning at least 30 per cent of their rival. (FWi) -- Chicken processing company, the Faccenda Group, has announced that it has no plans to close either its Telford or Dudley plant and in fact will be making significant investment in these sites. The Unite union had suggested that the company should consider closing the Telford or Dudley plant rather than the plant in Sutton Benger in Wiltshire, where a consultation period with staff is currently under way. Unite had said that it would make more economic sense to combine the Sutton Benger plant with the company HQ in Brackley, Northants. Coming out firmly against the closure of Sutton Benger, Unite regional industrial officer, Hugh Kirkbride, said: We believe this closure is totally unnecessary and does not make economic sense. Not to mention the impact it will have on the 450 staff who work there. This factory is the backbone of this local rural economy. However, dismissing this plan, a spokesman for Faccenda said a major £2m investment was planned for the Telford and Dudley plants. He went on: We can confirm that there are no plans to close the Telford site. In fact, as the company stated in April, we are investing significantly in the Telford site in the next few months. Irish Independent -- A number of merchants intend to significantly expand their grain-drying and storage operations this autumn rather than purchase the vast bulk of their stock off the combine. In a move which reflects the current uncertainty and volatility in the market, merchants have told farmers that they will not get involved in the kind of "Dutch auctions" which characterised last year's harvest. Where prices can't be agreed with farmers, compounders and traders have indicated that they will offer to contract-dry and store greater quantities of grain for growers. It is understood the move is motivated by the reluctance of merchants to commit to a harvest price in such a difficult market, and also by a desire from some growers to 'hedge' a quantity of grain until the trade settles later inthe year. Meanwhile, the futures markets for wheat have settled over the last fortnight, with prices easing back from the high which followed the floods in the US midwest. However, Matt Brazil of feed importers R&H Hall maintained that the uncertainty in the grain markets would continue right up to the end of the harvest at the very least. He pointed out that, although 20pc of the European harvest had been cut, very little had been traded to date. "The market is balanced very delicately at the moment and weather conditions between now and the end of the harvest are going to have a huge bearing on how prices develop,"Mr Brazil said. The recent poor weather has delayed the start of the Irish harvest. Farmers in Cork predict that it will be another week before the cutting of the winter barley crop gets under way. Farmers in the south report very good crops of winter barley, with few farmers experiencing problems with disease. Crops of spring wheat and spring barley are also said to be progressing well inthe south. However, spring barley crops in the northern half of the country are reported to be light, due to the drought in May. Local media report that more than 200 staff at the Peter Hunt Bakery, in Kearsley, near Bolton, have lost their jobs as administrators failed to find a buyer for the plant. There had been uncertainty as to the future of the bakery following parent company Lyndale Foods’ collapse last month. The Sale-based group, which specialised in the manufacturing and sale of various sweet and savoury bakery products, was put into administration in early June. A management buyout secured the jobs of 230 workers at Lyndale Foods' Hampsons bakery in Bolton but a Sayers Liverpool plant and around 40 Hampsons stores closed with a combined loss of 450 jobs. The Peter Hunt plant supplied various retailers with savoury pies and pastries. I wouldn't have thought that you needed to be an expert to suss that one out. What will they give us next? Noah hears rain forecast, opens account with Jewsons? (Telegraph) -- Britain is already in recession, one of the City's leading experts has warned. The economy started shrinking last month and will continue to contract until Spring 2009, according to Lehman Brothers, one of the world's major investment banks. The warning comes amid growing fears that the UK is facing its first major slump since the early 1990s, and follows a series of warnings from businesses and consumers. However, while most experts are predicting only a slowdown in growth later this year, Michael Hume of Lehman Bros said that a recession - defined as two or more quarters of successive economic contraction - was already underway. "We think the economy will contract in the third and fourth quarters, and then in the first three months of next year," he said. "It would be quite surprising if the recession didn't actually start in June." However, in more welcome news for struggling households, he predicted that as a result of the slump the Bank of England will be forced to cut interest rates to 3.5 per cent or lower, with the first cut coming amid the worsening barrage of economic news in November. A number of economic forecasters have warned that recession is a significant possibility, including Capital Economics and the British Chambers of Commerce. House prices are already falling at the fastest rate since the early 1990s property crash, according to figures from Nationwide building society, while official statistics showed recently that families' disposable incomes shrank in the first three months of the year. With families squeezed by higher taxes, rising interest rates and a slowdown in salary growth, they have resorted to dipping into their savings in order to stay afloat, according to official figures which show the savings ratio has slumped to a near 50-year low. Mr Hume said families would have to adjust to a fall in their standard of living as a result. "There is nothing quite comparable to what we're going through at the moment," he said. "There are some parallels with the 1990s, with house prices falling and so on. But on top of that you've also got this horrible commodity price shock which is eroding wages, and you didn't have that in the 1990s. "This is neither the 1930s nor the 1970s but it has certain elements of both." NEW YORK (MarketWatch) -- Crude-oil futures fell sharply for a second consecutive session Tuesday, trading as low as $136 a barrel, as comments from Federal Reserve Chairman Ben Bernanke lifted the dollar and put energy futures under heavy selling pressure. Crude oil for August delivery fell $5.07, or 3.6%, to $136.30 a barrel on the New York Mercantile Exchange. Earlier, the contract hit an intraday low of $136 a barrel, its lowest trading level since June 26. Other energy futures also posted sharp losses, with natural gas declining 3.5%. Gold and other metals futures also fell. "We're starting to see some of the fluff come out of the market a little bit," said Phil Flynn, vice president at futures brokerage Alaron Trading in Chicago. "The market is facing up to the fact that we're almost halfway through the summer driving season and demand is shrinking," Flynn said. Also "the dollar is up and that's going to put some pressure on oil." The dollar firmed against major currencies Tuesday, boosted by comments from Federal Reserve Chairman Ben Bernanke, who said the Fed may extend its lending facilities into next year. Corn and soybean futures extended Monday's losses in overnight trade. Corn is seen opening Tuesday's session 25c lower, soybeans 30c lower and wheat mixed. The US agricultural attaché estimates Russia’s wheat production in 2008/09 at 54.0 mln t which is above the 49.4 mln t in 2007/08. This is due to an expected higher harvested area of 25.5 (24.5) mln ha and higher yields of 2.1 (2.0) t/ha. Exports may increase to 12.5 (12.0) mln t, feed use should reach 16.0 (15.4) mln t and other use 23.0 (22.8) mln t. Ending stocks may therefore recover enormously to 6.1 (2.6) mln t.
Barley production is also projected to rise to 17.5 (15.7) mln t due to possible higher yields of 1.8 (1.6) t/ha, although the harvested acreage should reach only 9.6 (9.8) mln ha. Exports are expected at 1.3 (1.0) mln t, feed use at 11.3 (10.7) mln t, and other use at an unchanged 4.6 mln t. Ending stocks can thus recover to 1.3 mln (776,000) t.
Corn output is forecast at 6.8 (4.0) mln t on a higher harvested area of 1.8 (1.3) mln ha and due to higher yields of 3.8 (3.0) t/ha. Exports may rise to 200,000 (50,000) t, feed use to 4.2 (3.4) mln t, while other use is stable at 600,000 t. Thus ending stocks should increase significantly to 2.1 mln (225,000) t.
Rye production is estimated at 4.0 (3.9) mln t, the harvested area at 2.3 (2.1) mln ha, yields at 1.7 (1.9) t/ha, exports at 75,000 (0) mln t, total consumption at 3.7 (3.9) mln t, and ending stocks of 351,000 (76,000) t.
Poultry supplier Sun Valley Europe has announced it is changing its name to Cargill Meats Europe, adopting the globally established name of its parent company, Cargill Inc. According to MeatInfo, Richard Maxfield, managing director of Cargill Meats Europe said: “Sun Valley has been part of the Cargill family of international companies since 1980 and during this time, we have grown significantly and prospered into one of the UK’s leading poultry businesses. The re-branding has started and will rollout across all areas of the business over the next two years. Although the company will now be known as Cargill Meats Europe, it said it will take some time to completely renew all aspects of the business. As such, the company will be working with its farms, factories and partners to develop the new look over the coming months. (DTNAg) -- In the midst of the widespread selloff in commodities Monday, we're hearing some numbers bantered about regarding CRP. It's being widely reported that USDA is close to announcing a decision to allow some acres out of the Conservation Reserve Program without the usual penalties, in response to intense pressure from the livestock industry for relief from high feed costs. DTN's Man on the Floor at the CBOT Gary Wilhelmi said he's hearing talk that USDA will get 12 million acres out of CRP, and that those acres will be principally wheat acres. All commodities are down to start the week, but there are still bullish factors lurking, Wilhelmi said, especially talk about yields. Floor sources are saying soybeans are more vulnerable to reductions, but there's still 4 to 6 million acres of corn that's no more than 8 inches tall, so there could be serious yield loss there, as well. Wilhelmi said one trader told him he expects Dec corn could lose another 30 cents beyond today's losses, then buyers will be back in. Whether that was a trader talking his own position remains to be seen, of course, but that's a sample of the Monday chatter. (Telegraph) -- The price of meat, milk and other British farm products will have to rise to reflect the environmental cost of producing them, a Government study has concluded. A Cabinet Office review of food policies suggested that farmers and their customers will have to pay a "green price" on farm goods that generate large amounts of greenhouse gases like methane and nitrous oxide. Methane is produced by the digestive processes of livestock, and nitrous oxide is released from many agricultural fertilisers. Scientists say both contribute to global warming along with carbon dioxide, and the report estimates that farming accounts for as much as 12 per cent of all greenhouse gas emissions. Current emissions trading systems apply only to carbon dioxide, and the Cabinet Office study says methane and nitrous oxide should also carry a financial price reflecting their environmental impact. The report said: "Almost half of the UK food chain’s total greenhouse gas emissions are from agriculture. "There is no equivalent to a carbon price on emissions of methane and nitrous oxide, which account for around 80 per cent of the global warming potential of farming’s greenhouse gas emissions. This is not sustainable or efficient in the long term." The Government’s new Committee on Climate Change is now examining whether the UK should set targets for methane and nitrous oxide like those currently applied to CO2 production, the report said. And the Department of the Environment, Food and Rural Affairs has started research on "robust and cost-effective mechanisms for internalising the external greenhouse gas costs of agriculture," systems that would "price in" the environmental consequences of farming. The report also promises more action to help farmers reduce their greenhouse gas production by generating more of their own electricity from farm waste, and proposes changes in livestock diets to reduce gas emissions. (Telegraph) -- The great oil shock of 2008 is bad enough for us. It poses a mortal threat to the whole economic strategy of emerging Asia. The manufacturing revolution of China and her satellites has been built on cheap transport over the past decade. At a stroke, the trade model looks obsolete. No surprise that Shanghai's bourse is down 56pc since October, one of the world's most spectacular bear markets in half a century. (Telegraph) -- Bradford & Bingley shares tumbled to new lows today, dropping further below the 55p-a-share price of its £400m rights issue, as the City speculated that the buy-to-let lender is worthless. The group's stock plunged more than 22pc to just 32.5p in early trading this morning. The slide follows a wave of investor concerns yesterday, after Pali International, a stockbroker, cut its target price for the bank to "zero" and calculated B&B's "net present value" to be -14p. In a separate note, banking specialist Fox-Pitt, Kelton said: "We cannot rule out the possibility of an effective failure with shareholders receiving little or nothing for their shares." This came in the wake of last week's Moody's downgrade and decision by TPG to pull its planned £179m investment. In frantic efforts to keep B&B's capital raising on track, four of its core shareholders stepped in to support an enlarged £400m rights issue alongside the six largest high street banks. Leigh Goodwin, an analyst at Fox-Pitt, reduced his share price target to 43p, is "forecasting losses by 2010" and raised questions about whether "B&B is going to be Northern Rock in slow motion". He added: "The downgrades and publicity surrounding the stock will almost certainly lead to increased funding and liquidity pressures." Corn and beans have extended last night's sharp declines and are substantially lower again this morning. Corn which was largely limit down last night leads the way again this morning with Dec 23c lower, making for a 53c decline since Thursday night's pre-holiday close. The USDA upped it's good/excellent rating for both corn and beans by one percentage point after last night's close. Whilst this was largely expected, it reinforces the view that, given warm but not too stressful weather, a decent crop is still possible. In Iowa, the top corn-producing state, 57% of the crop earned the good-to-excellent condition rating, four percentage points above the preceding week. In Illinois, the good-to-excellent condition rating for the corn crop was 63%, up three percentage points from the preceding week. Adding to pressure on corn is lower crude and the growing anti-biofuel movement. Additional pressure comes from Informa's crop estimate released yesterday saying that 2008 corn output will total 12.002 billion bushels, up 2.3 percent from the Department of Agriculture's June 10 forecast of 11.735 billion bushels. November soybeans are currently 22c lower, having also declined the daily limit 70c last night. In top soy producer Iowa, the good-to-excellent condition rating for the soybean crop was 57%, one percentage point above the preceding week. In Illinois, 56% of soybeans were in good-to-excellent condition, a four percentage-point gain on the week. Wheat is steady overnight after the USDA showed a surprise drop in the good/excellent category for spring wheat of five percentage points. North Dakota, the biggest producing spring wheat state, saw an eight point drop from last week to 69% which seems to have heavily influenced the final result. Still 69% good/excellent is still a significant figure and some traders are questioning whether last week's number was overstated and this is simply a correction. "We have a really good looking spring wheat crop out there," said one trader. The USDA said 52% of the U.S. winter wheat crop was harvested, up from 36%last week but below the five-year average of 61%. September wheat is 2c firmer overnight, having dropped at 51 1/2c last night's close. The USDA reported Monday 62% of the corn crop in good/excellent condition, up one point from last week. Soybeans good/excellent were also up one point to 59%. Winter wheat harvested showed good gains at 52% done, up from 36% a week ago, and only slightly down on last year's 53% completed. Spring wheat good/excellent fell five percentage points to 69%. (Polish News Bulletin) -- One of the biggest agricultural consortiums in the world, Cargill, has won a four-year long arbitration battle against Poland. The verdict was kept secret for several months, but now it is clear Poland was ordered to pay around $16m, plus interest, which means a total of $20m. Iwona Wdowczyk, spokesperson for Cargill in Poland says the company is pleased with the way the case has ended, but she points out that Cargill asked for $84m in compensation. Corn opened limit down on Chicago and is still locked in limit down at 15.54 BST. Nearby beans are 64 1/2c lower and wheat 49 3/4c easier. Weakness in US futures has spilled over into EU grains with London-based feed wheat GBP4/tonne lower, Paris based milling wheat EUR5-5.50/tonne lower, corn EUR7/tonne easier and rapeseed down around EUR7/tonne. EU grains are mostly lower this morning following the lead from eCBOT futures which have closed sharply down across the board. London-based LIFFE feed wheat for November is GBP2.75 lower at GBP147/ton. Paris-based November milling wheat is EUR5.50 lower at EUR198/ton. November corn is down EUR6 at 201/ton and November rapeseed is down EUR3.50 to EUR465/ton. "Wheat has been held up by (Chicago) corn and soybeans and it's due a drop," said a London-based broker. The French winter barley harvest has begun according to French traders. "People are satisfied with yield and quality," said a France-based broker. The outlook for the wheat harvest in France continues to be positive, added the broker. Last week Egypt's state-owned General Authority for Supply Commodities purchased 150,000 metric tons of Russian, Ukraine and Canadian soft wheat. This is viewed as a further indication that European prices are not currently competitive on the export market due to aggressive pricing from the Black Sea region where the harvest is in full-swing, a trader said. Corn futures are called 25 to 30 lower, soybeans 30 to 40 lower, and wheat 20 to 25 lower. Nearby corn closed the overnight eCBOT session 34c down, soybeans 38 1/2c down and wheat 27 3/4c lower. (Cattle Network) -- Cooperative weather allowed much of the state to proceed with wheat harvest over the Fourth of July weekend. At this point, southern Kansas is all but finished, with northwest Kansas getting over the halfway mark. Shirley Zweygardt, grain merchandiser at the St. Francis Mercantile Equity Exchange, says harvest is about half complete in Cheyenne County, with the elevator taking in about 500,000 bushels so far. Test weights average about 61 pounds per bushel, and protein has ranged from 13.8-14.5%. Yields range from 20 to 60 bushels per acre. Harvest is also about half finished in the Oberlin vicinity, says Dalene Horton, grain merchandiser of the Decatur Coop Association, Oberlin. Above average grain quality is standard, with test weight averages of 61-62 pounds and protein, 12%. Farmers are reporting yields in the 50-60 bushel per acre range. The Ransom branch of the Garden City Coop has taken in about 500,000 bushels as harvest winds down, according to manager Wally Schweitzer. On average test weights are 61 pounds per bushel, with protein averaging in the low 11% range. Yields of 50 bushels per acre are the norm, Schweitzer says. Woodston farmer Jerry McReynolds, secretary/treasurer of the National Association of Wheat Growers, finished Saturday. He reports that where hail and wind missed the crop, yields averaged 45 to 50 bushels per acre in his area. Dave Studebaker, manager of the Delphos Coop Association, says harvest in northern Ottawa County is nearly complete. Studebaker anticipates the elevator will take in 1.4 million bushels of grain, as farmers report yields averaging about 50 bushels per acre. Quality is very good, with protein values of 12% and above and test weights, 59-60 pounds per bushel. Test weights are down three pounds from the beginning of harvest. Chad Baker at the Seneca location of the Nemaha County Coop Association, says harvest should be complete by the end of the week. It’s been a disappointing wheat harvest, as rain showers have compromised test weights, which average about 52 pounds per bushels. Protein values are about 11.5% and yields have ranged from 15 to 60 bushels per acre. The 2008 Harvest Salute to Producers is brought to you by Kansas Wheat in conjunction with sponsors the Kansas City Board of Trade, DeBruce Grain and the Kansas Grain and Feed Association. (Daily Telegraph)-- Gordon Brown is urging British consumers to stop wasting food amid growing concerns over the sharply rising cost of basic necessities. 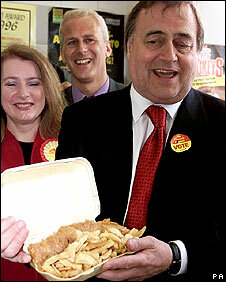 That's rich, get your own house in order Gordon. You can start off by telling that to Johnny "three lunches" Prescott, he's wasted more than most methinks. British farm minister Hilary Benn called on Friday for the European Union to speed up the approval process for imports of genetically modified (GM) crops. Benn told reporters at the Royal Agricultural Show it was important for British livestock farmers to be able to access as many feed sources as possible at a time of rising costs. "I do want the EU to speed up the process. It is a very important part of helping farmers with some of the challenges they have clearly got," he said. Genetically modified crops now account for about two-thirds of the world's soy crops, just under 50 percent of cotton, about 25 percent of maize and 20 percent of rapeseed. 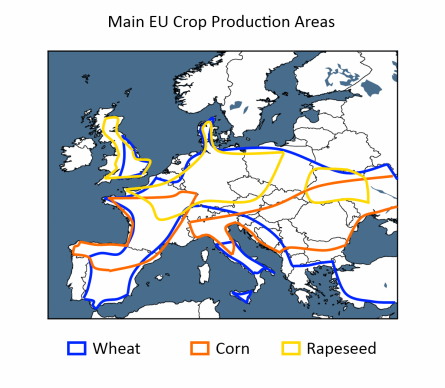 There is significant opposition to GM crops in Europe with opponents citing both food safety and environmental concerns. EU countries rarely agree on anything to do with GM products and their discussions on authorising imports on new modified products often descend into ill-tempered deadlock. When this happens and the ministers fail to achieve a majority under a complex weighted voting system either to reject or approve the application, EU law provides for the European Commission, the bloc's executive, to issue a default approval. The prolonged process has ensured approvals have been slow. Benn said there was no evidence that GM crops were not safe to eat, the key issue for imports. Monday night sees the release of the latest crop condition ratings for corn, soybeans and spring wheat. The report will also detail winter wheat harvest progress. Leaders of the Group of Eight (G8) countries meeting Tuesday through Thursday in Japan next week. While financial and economic issues will be on their agenda, a clear focus is expected on the world food price and supply situation. Many are calling for these key nations to do more to help the developing world cope with higher costs. The monthly USDA Supply & Demand and Crop Production Reports will be released Friday morning, and that will be a late-week focus for markets. The production data will feature the first survey-based estimate of the U.S. total wheat crop for 2008. On the S&D side, traders will watch how the updated acreage figures from USDA will be blended into the balance sheets for corn, soybeans and wheat in particular. There's a growing expectation that USDA will make an announcement after the July 11 S&D report on whether or not they'll allow Conservation Reserve Program (CRP) contract holders to exit those contracts early without penalty. The key to any announcement is if the penalty-free early out is allowed as many expect, how many acres will be offered that option to bring ground back into production for the 2009 growing season. Corn, soybeans and wheat are all sharply lower on the overnight eCBOT market this morning amid speculation that warmer weather will improve crop conditions in the U.S. Midwest after the worst flooding in 15 years. The National Weather Service's six to 10-day outlook issued yesterday showed above-normal temperatures in the U.S. Midwest, including Iowa, Illinois, Indiana and Ohio. About 61 percent of the corn crop was in good or excellent condition on June 29, up from 59 percent a week earlier as warmer temperatures boosted growth. The condition ratings for U.S. corn and soybeans did improve last week slightly and traders will want to see whether that happens again in the data released Monday afternoon. The data will be a factor in market action on Tuesday. Western Australia, the country's largest grain grower, may get some rain in the coming week, and the country's east will likely also receive showers, the National Climate Center said. Rain is critical in the coming months to bolster yields after farmers sowed a record acreage to wheat this season. A front may bring rainfall of up to 25 millimeters to the cropping regions of Western Australia, said Shoni Dawkins, a climatologist with the center. Victoria and New South Wales may receive between 15 and 25 millimeters, he said. At 10.55am BST corn was 25-30c lower, soybeans around 28c easier and wheat around 24-25c down. Un-named multi-national businesses that have reported an increase of profits up to twenty times greater than last year are fed up being blamed for food price increases world-wide. 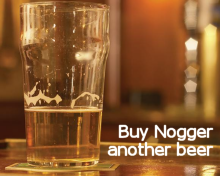 The un-named businesses have consequently appointed a multi-company corporate spokesman to help allay these fears. "Whilst we may have seen our profits increase by unprecedented levels in the last 12 months, there is no food crisis, it's a myth. Food for fuel is a good thing," said the newly appointed spokesman at a conference outside an Ethiopian bread queue yesterday. (Farmer's Guardian) -- FOOD prices have been driven up by a lack of political leadership – not biofuels – a leading crop expert has claimed. Urging politicians not to scrap mandatory biofuel targets, Richard Whitlock, from agricultural experts Frontier, said that the world was not short of land or food and that political dithering was fuelling the current food crisis. “The UN’s Food and Agriculture Organisation say that one billion people do not get enough food but 50 per cent of all the food we produce in the world is wasted and millions of square kilometres of land are available for agricultural production,” he said. Mr Whitlock said that the greatest input into the rise in food prices was energy, not biofuels and that sustainable biofuels offered real greenhouse gas savings against fossil fuels. He said the government must hold firm in the face of NGO calls to scrap biofuel targets. “Biofuel production uses a relatively small proportion of land,” he said. (Farmer's Guardian) -- ALLIED Mills has announced a special buy-back contract for newly Recommended Group 2 wheat, Marksman at £20/tonne over feed for harvest 2009. Designed to encourage growers to take up a variety for which the leading miller sees considerable future potential, the contract should provide sufficient incentive to encourage strong initial grower uptake. Allied group wheat and procurement manager, Howard Leland said they wanted to encourage growers to give it a go. PARIS (AFP)--European Union energy ministers said at an informal meeting Saturday they had been labouring for 18 months under the false impression that an E.U. plan to fight global warming included an obligation to develop controversial biofuels. What seems to be a stunning misreading on the part of policymakers in Brussels comes at a time when the image of biofuels has shifted over a matter of a months from climate savior to climate pariah. Documents issued by the E.U. describing its ambitious energy and climate plan, unveiled in January 2007, have consistently said that 10% of all the fuel powering vehicles would come from plants by 2020. A closer reading of the texts by the ministers apparently revealed otherwise. "The member states realized that the Commission's plan specifies that 10% of transport needs must come from renewable energy, not 10% from biofuels," Jean-Louis Borloo, the French environment and energy minister, said at the close of the three-day gathering. Jurgen Homann, the junior economy and energy minister from Germany, also confirmed the misconception. The ministers "discovered" that requirements for transport "do not speak of biofuels, but renewables," he told AFP. The majority of biofuels produced in the world today are extracted from corn in the U.S., sugar in Brazil, and both grain and oilseed crops in Europe. Heralded as recently as last year as a silver bullet in the fight against global warming, biofuels were seen as a relatively carbon-free way to fuel cars and trucks. "A year ago you were considered an ogre if you were not in favor of biofuels," Borloo told journalists on the sidelines of the meeting. In recent months, however, biofuels have been fiercely criticized for driving up world food prices, diverting precious crop land and aggravating deforestation. An unpublished World Bank report blamed biofuels for a 75% rise in the price a basket of staple food items, the U.K.'s Guardian newspaper reported Friday. The new reading of the E.U. "action plan" for energy and climate policy immediately raises the question of what - if anything - will replace biofuels in fulfilling the 10% transport requirement by 2020 for renewable energy. "Things are changing very, very quickly," said Borloo, citing a number of new technologies under development ranging from hydrogen fuel to fuel cells. At the same time, he acknowledged that "99.9% of the renewable fuel now available for vehicles is biofuel." The E.U. plan calls for 20% of all energy needs in the 27-nation bloc to be met from renewable sources by 2020, and for an 20% reduction of greenhouse gases - compared with 1990 levels - by the same date. Borloo also noted a shift already underway towards so-called "second generation" biofuels made from non-food sources such as switchgrass and wood byproducts.